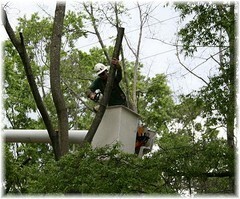 Removing a tree is an everyday reality for your local tree removal contractor. With skills sharpened by years of experience and tools ready to do the job, your local contractor can remove your trees in the safest, most thorough manner. No matter what your situation is, your tree removal contractor has not only seen it before, he also knows the correct, and safest way to handle it. While the removal of a tree may not be an everyday occurrence in your yard, it is a common service that people everywhere have done. It is important to remember that when tree removal is discussed, the conversation is not always about cleaning up after a storm. Often it involves the need to remove a living tree that is currently growing on your property. There are three major reasons why homeowners have trees removed: the trees are diseased or damaged and pose a threat, the trees are adversely affecting their view, or the trees are growing too close to the home or other structure. When homeowners plant trees, many times they don’t realize how large that tree will grow, or how extensive the root structure will become. Without considering this, they may plant the tree too close to their residence and then find, in 10 to 20 years, that the tree and roots are causing structural damage. Unfortunately, not only does this increase the risk of home damage, flood, mold and other issues, it also makes tree removal more difficult. If the tree roots are affecting your foundation, or, if the very bottom of the trunk is close to your home, the precision work of a professional tree removal contractor is vital in order to avoid damage to your home and costly insurance claims. Trees too close to the home can also cause roof damage from branches rubbing on the roofing material, or by causing enough shade that moss and other moisture problems set in. It is important to consult with a professional if you notice signs of your roof growing moss, or branches hanging too close to the roof. What if it’s not your view you are worried about? What if you have a sick tree that loses large and heavy limbs during the most minor breeze or is spreading its disease to other trees in your yard? 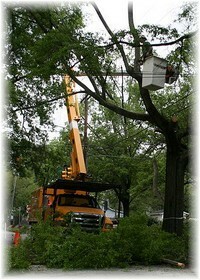 These situations often require even more care during the tree removal process. A sick tree, either from disease or dehydration, poses additional risk when you remove it. The weak branches and unstable trunk can make tree removal precarious. The combination of homeowner, diseased and weakened tree limbs and power lines is another recipe for disaster. Many homeowners underestimate the proximity of the power lines. Thinking that the tree they are removing can’t possibly cross to those lines leaves many of them unprepared for it when they do. Again, trees are not predictable, and assuming that you will be able to avoid hitting a power line when you remove them is a dangerous proposition. There are many factors that go into buying a home, but most realtors will tell you that the most important is location. You can change just about any part of your house-you can give it a second story, add a bathroom, take down walls and build a balcony-but you simply can not change where it is located unless you undertake the expensive and time draining project of relocating your house. Since house moving is not an entertaining pastime, home buyers enter into a location-oriented focus that compels them to purchase homes in the very location they want to be. This might mean a home on a lake, on a hill with a gorgeous mountain view, or on a beach somewhere. Unfortunately for some, the view they so painstakingly found and bought the house for is really a potential view currently hidden behind a tree, or maybe even several rows of trees. This means that they must have a tree removal service before they can actually begin enjoying their view. Many homeowners think (especially if they own a large piece of property) that they can handle the tree removal themselves. After all, they have seen others taking down trees. One simply makes some notches, gets some rope and yells, “timber” right? This line of thinking is the very one that results in damaged sidewalks, ruined roofs, and injured homeowners. Instead of risking life and limb to remove your trees, why not call your local tree removal contractor? They have the knowledge, experience and tools necessary to get the job done safely.